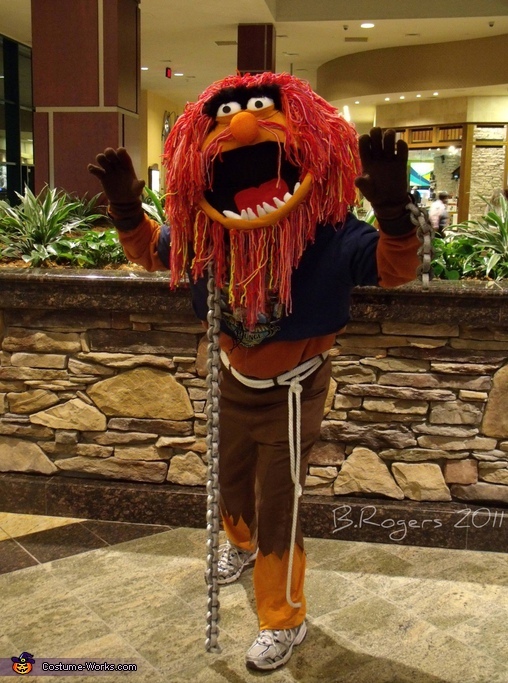 This is the Muppets Animal costume that I made for my fiance to wear. I made the headpiece from paper mache, fabric, felt, yarn, foam and a hard hat for stability and to make it easier for him to wear. His outfit was made, refurbished or recycled by me to create Animals disheveled look. Even his Chain & shackles were all handmade & spray painted chrome to look like real metal. Great job! You got that sewing talent from Mom. The costume looks like someone just bought it off the store shelves. Incredible job! This costume is so great because it's all made by hand, Bravo! With this much talent, the designer is wasting her time by doing any other form of work. Amazing detail in the costume love it.It must have taken alot of time and effort to do.You really deserve to win good luck! this is a great job. Like the details and all the work put into it. Such hard work put into it and should be put on the market. Thank you for sharing this with us and again such a wonderful job! very neat picture this is...love the muppets animals....keep up the good work with everything you are doing...Great Job! awsome animal costume its the best!!!!! Any chance on purchasing this from you? for GOD'S SAKE! i want thisssssss desperately! can i purchase this costume?????????? Hi i just saw the costume you made and I love it! Would love to buy it off you for my husband if you still have it. Would love to buy this or learn how to make it. Amazing!